This is literally the most comforting thing I’ve ever eaten. It was heavenly. I wasn’t feeling very well earlier this week and was in desperate need of some comfort food. 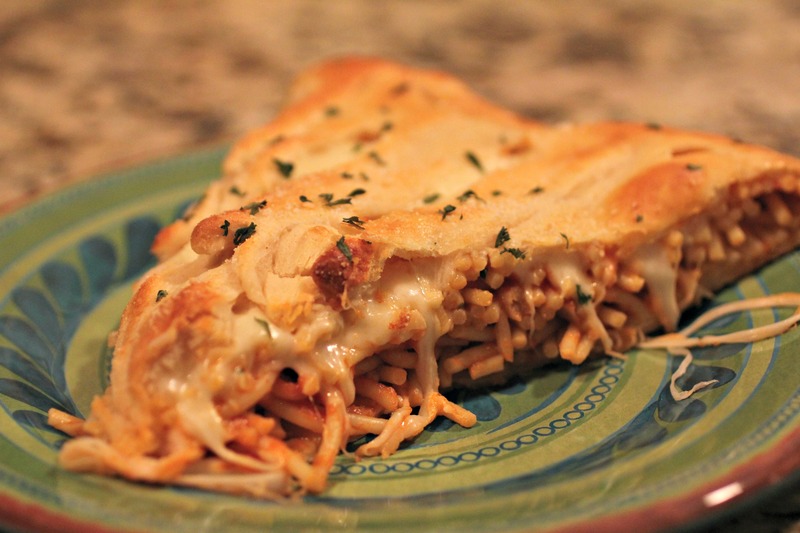 Saucy pasta with gooey mozzarella cheese all wrapped up in warm, buttery bread was exactly what I needed! Carbs wrapped in more carbs is definitely the way to go if you’re looking for comfort food. I loved this dish so much that the next morning when I was getting ready for work, and still feeling icky, I told myself, “It’s ok. I get to eat that leftover spaghetti braid for lunch!” Yup, thinking about this food is what helped get me through the day. And ya know what? That was the best lunch of leftovers I’d EVER eaten, and it really did help me to feel better and get through the rest of the work day. See? Comfort food! This may look somewhat challenging, but I promise it’s really not! 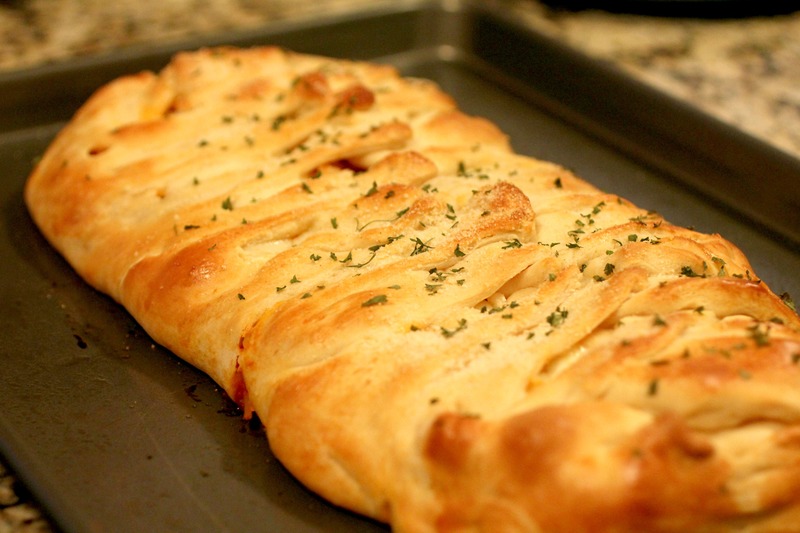 It’s still a really easy recipe, but it just looks so fancy when you pull it out of the oven! That’s another thing I love about it. 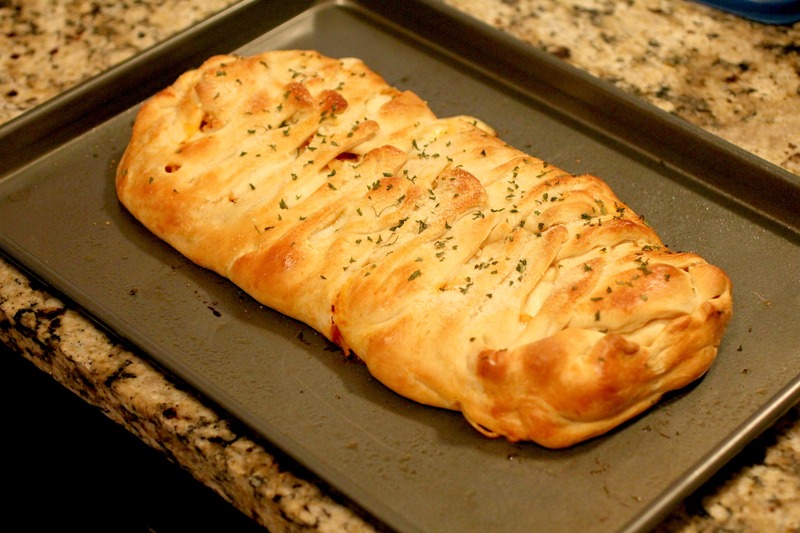 Mine did kinda widen/spread out a bit on the pan and looks a bit like a flattened Jabba the Hut, but that’s because I didn’t have any parchment paper, and I was trying to lift this giant doughey braid off of the counter with my hands , haha. Yours will probably turn out looking better than mine! Go make this dish! You won’t regret it! Unroll crescent dough onto a large sheet of parchment paper. Flatten dough and pinch together seams, making a rectangle about 12 x 16 inches. Stir together sauce and cooked pasta. 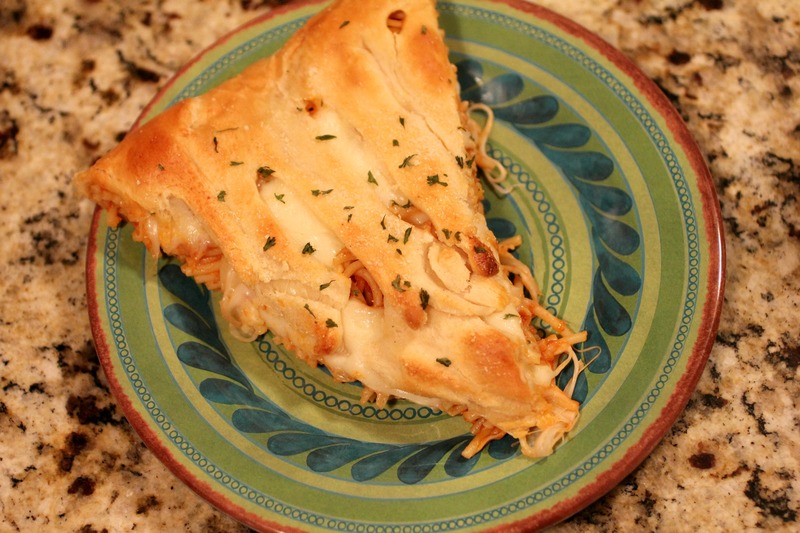 Place spaghetti down center of dough (try to keep it to about 5 inches in width, leaving several inches from the sides of the dough). Top with cheese cubes. Make cuts 1 1/2-inches apart on long sides of dough to within 1/2-inch of filling. Then braid strips left over right, right over left. Make sure all the pasta is securely tucked inside the dough. Pick up the parchment paper with braid on it and place on a large baking sheet. Brush with egg white and sprinkle with Parmesan cheese and parsley. Bake for 25-30 minutes or until golden brown. Cool slightly and slice to serve. Just imagine the smells of warm bread and Italian seasoning filling up your kitchen! Then you’ll really drool! It was almost too hard to wait for it to come out of the oven! Thank you! Not that I can take credit for the creation of this recipe, but mmmm it was certainly delicious! Found your blog on pinterest…..It is wonderful, the kind of cooking I have done for over 46 years of marriage. So glad to find one that is “normal”! Cannot wait to try some of your recipes. Thank you! So glad you found my site! Congrats on 46 years of marriage, by the way. Hope you find many more recipes to share with your loved ones!